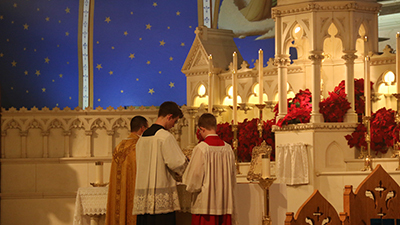 Because the TLM is different from what the Mass most Catholics now know, it can often seem strange at first. One reason why it may seem odd is because most of the Mass is spoken in Latin. Once you have attended a few times, you’ll begin to learn and appreciate the beauty and reverence of the service. So, if you’re considering trying out the TLM, we recommend you dedicate to try 4 Sunday's in a row for you and your family. For most, that’s enough for them to fall in love with the old form of the Mass rich with history. If you've taken the 4 Mass Challenge, visit our Facebook and let us know!